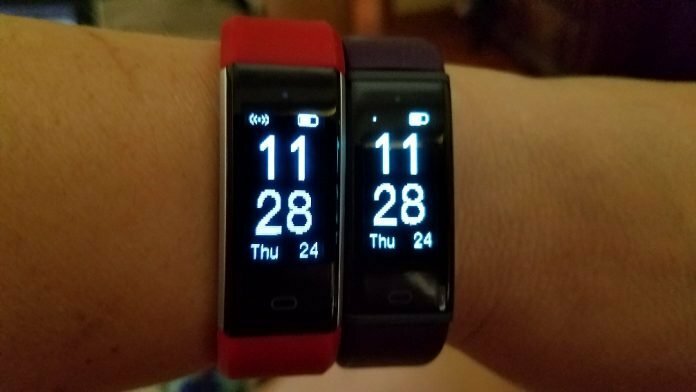 While I’m finishing up my review of the Ticwatch Pro smartwatch, I’m also reviewing a couple more inexpensive, budget friendly fitness trackers. I really enjoy testing these out. The first one is the Kinbom Fitness Tracker on Amazon. This is an activity tracker currently priced at Out of stock with a color screen, IP 68 water rating which isn’t suitable for swimming but still a good rating that I would recommend, as long as you don’t plan to wear it swimming. However, it can get wet or even submerged for a few minutes and it should be fine. It has step tracking, a heart rate sensor with continuous heart rate tracking, sleep tracking, 14 different sports/fitness activities to choose from, smartphone notifications, a good battery life of about 7 days and uses the VeryFitPro app which I’ve used several times before with other fitness trackers and it’s one of the better apps available for inexpensive trackers. The Kinbom is similar to the Lintelek and Letscom bands that I’ve already reviewed (both tested out well in most areas) but has a color screen and I think the step tracking behaves a little differently but I’ll be testing that out. The other tracker I chose is the Feifuns smart braclet. (Available on Amazon) While I expect the Kinbom to test out well, I’m not so sure about this one since there isn’t much feedback yet but it caught my eye because it’s similar in style to the Fitbit Versa while the Kinbom is more reminiscent of the Fitbit Alta, both on Amazon as well. I’m not expecting the Feifuns to be anything like the Versa but if you’re wanting a fitness tracker that looks less like a bracelet and more like a watch then this might be one to look at. I’ll be very surprised if the blood pressure monitor is accurate. The only tracker I’ve tested so far that has tested well for blood pressure monitoring is the Tom Tony P3. I would suggest waiting for my review of the Feifuns smart bracelet before purchasing it because there’s not much information on it yet and I’ll be putting it through its paces but I certainly hope it tests out well. UPDATE: Well, I received the watch but it wouldn’t charge or turn on and it looks like the unit had been returned before. It’s a shame because I really liked the look and size of the watch. I might try again or try to find something better of the same style.